My wife, Roberta, and I are into food-cooking it as well as eating it. Between us we’ve taken maybe a dozen one- or two-day weekend courses in preparing French Provençal, Cantonese, Szechuan, Vietnamese and Southwestern dishes. Roberta was once a banker in Brazil and is fluent in that country’s cuisine. But until last summer we didn’t know much about preparing Italian dishes. 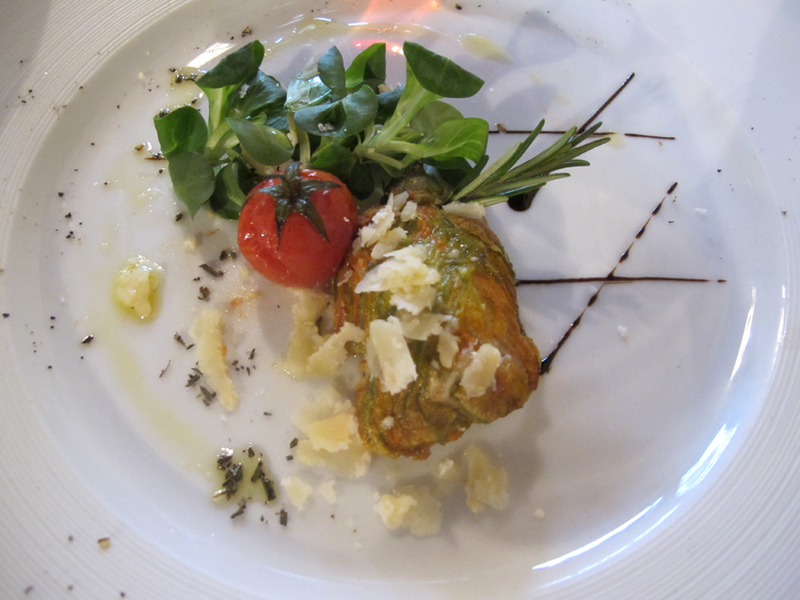 That changed when we added five glorious days of cooking school to the itinerari of a vacation to Italy. It wasn’t the least expensive part of our trip, but it provided experiences that we can relive every time we don aprons and belly up to the stove. Choosing a school is harder than we imagined. There’s a lot to choose from. The indispensable The Guide to Cooking Schools (ShawGuides, $19.95) lists 41 cooking schools in Italy (as well as 37 in France, 24 in England and hundreds in the U.S.), and dozens more elsewhere. More perplexing, the schools’ programs and their prices differ enormously. Some schools, including the Hotel Cipriani Cooking School in Venice, are essentially lecture courses: Students watch and take notes as Renato Picolotto demonstrates the proper way to make black tagliatelle or stuffed cannelloni. Price for the five-day course is $3,385 per person, including a room at the famed Cipriani. Roberta and I wanted to learn by doing, not watching. After narrowing our preferences down to schools in Naples, Venice or Tuscany, I visited the ShawGuides Web site on the Internet (www.shawguides.com) and came up with 20 candidates. 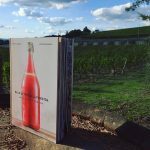 We wrote away to each, sorted through the brochures that came back, and eventually settied on a school named La Bottega del ’30 – literally the Shop of ’30. (The name comes from the address of a fabled old Italian bordello). It’s not the fanciest cooking school, nor the most expensive, but it added immeasurably to our holiday (and slightly less to our waistlines). The school and its related public restaurant are the primary sources of activity in Villa a Sesta, a tiny hamlet in Tuscany’s hilly Chianti region 15 miles northeast of Siena and 45 miles southeast of Florence. 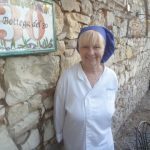 Bottega del ’30′s owners are Helène Stoquelet and her husband, Franco Camelia. 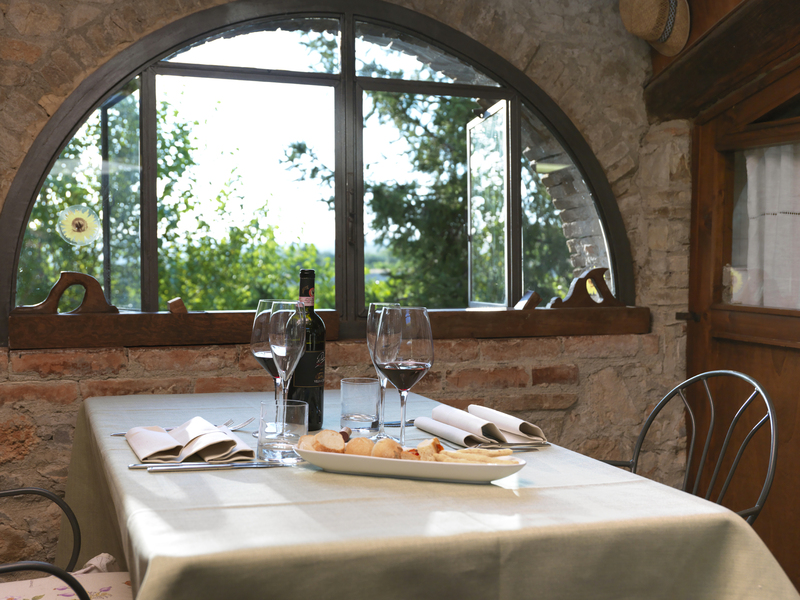 In Villa a Sesta they have three interconnected fieldstone-and-stucco buildings that surround a courtyard and house their family, the cooking school and their Ristorante La Bottega del ’30. So popular is the restaurant with the locals that you almost need to enroll in the school to get a table. The school houses students in nine spacious and nicely decorated apartments. Stoquelet and Camelia offer a Sunday-to-Saturday curriculum that is limited to ten students per session. 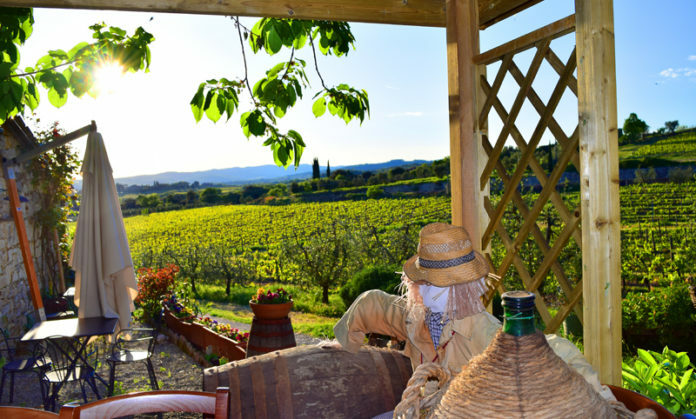 You check in Sunday afternoon and maybe lounge around the pool with its views over vineyards and olive groves, or play some tennis on a nearby court. 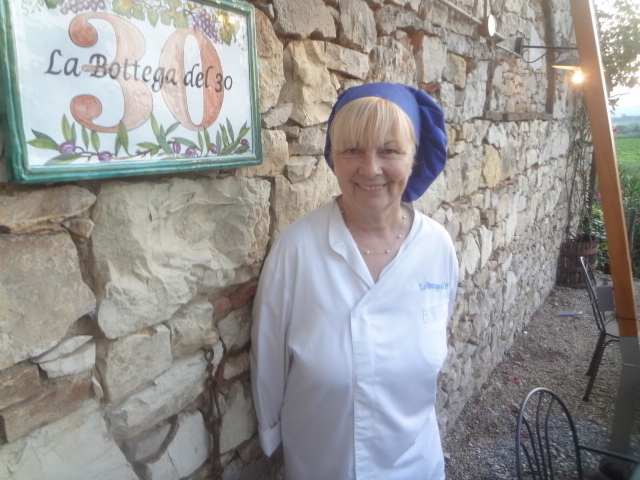 The program kicks off Sunday night with a sumptuous meal at La Bottega del ’30 restaurant, where Stoquelet and Camelia prepare and serve up a kind of introductory course on the Chianti region’s food and wines. Of particular note are Stoquelet’s zuppa di faggiano, a pheasant soup, and malfatti con fonduta di pecorino, tender spinach dumplings in a cheese sauce. For wines, we found the 1994 Verdicchio di Jesi particularly rewarding. You learn to cook between breakfast and lunch during the next five days, Monday through Friday. The classes run from 10 a.m. until around 12:30 p.m. at ten individual cooking stations-a stovetop and cutting board with all the necessary utensils. Each morning Helène Stoquelet focuses on the successive stages of a meal. Monday, appetizers. Tuesday,soups and sauces. Wednesday, pastas. Thursday, main courses. Friday, desserts.Students also work on complementary dishes, so the class creates a full meal each day. Stoquelet speaks little English, but an English-speaking food expert is always on hand for English-speaking students. My personal triumph? Cupola delicata, a pasta dish that comes out looking like the dome atop an Italian basilica. We started with a metal bowl, coated the inside with butter, then lined the inside with partially cooked strips of uncut ziti, making it look like the inside of an upside-down beehive. We then added a filling of peas, tomatoes, zucchini, mushrooms, carrots and more ziti (diced this time), all held together with a béchamel sauce. After baking for 45 minutes, we let it set, then slid the dome-shaped dish out of the bowl. Perfection. About 12:30 each day, the wine came out, usually a Chianti or a Brunello. After cleaning up, we’d sit down with our fellow students to sample what we’d prepared that morning. The best way to learn to cook is by doing, and eating what you’ve done. Afternoons were free time. For those so inclined, the proprietors arranged field trips: to a grappa distillery, to the local Prada outlet store, a car tour of the lovely Tuscan countryside, its arid ruggedness cloaking a soft and verdant underside. Each night we dined at a different local restaurant – all arranged and prepaid by the school. Friday night’s meal was back at Ristorante La Bottega del ’30 – a graduation party of sorts with each student receiving a diploma, a chef’s toque and an apron. Stoquelet prepared tomato bruschetta with a porcini salad, followed by ravioli stuffed with pigeon in a pine nut and rosemary sauce. Then a honey-colored roast duck stuffed with a wonderfully flavored wild fennel, followed by tiramisú, the luscious dessert made from soft mascarpone cheese, cream, marsala wine and lady fingers dipped in strong espresso. Cost for all this: $2,200 per person and that includes everything: room and board for six nights, the cooking lessons, the side trips, those splendid evening meals out. I gained seven pounds, but it was worth every ounce.